The slender salamanders are a California specialty. They occur throughout the California coast ranges, in the Sierran foothills, and in the transverse ranges of southern California, but beyond the state they make it only to Oregon and to Baja California (in this they remind me of the Wrentit Chamaea fasciata, the only babbler in the New World). I've always like this photo (right; B. attenuatus); I think it should be labeled "ATTACK OF THE GIANT BATRACHOSEPS." 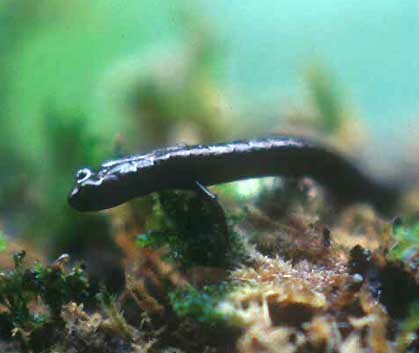 But slender salamanders in the genus Batrachoseps are actually very tiny -- usually just 2 or 3 inches long. Yet their biosystematics is fascinating and has been entirely turned upside down in the past decade. It turns out that the slender salamanders on the central California coast are a mosaic of six different species! And in all there may be 20 species from Oregon to Mexico! The one photographed (above) is the newly described Gabilan Slender Salamander Batrachoseps gavilanensis.1 Jockusch, Yanev & Wake (2001) name four new species from Monterey and San Luis Obispo counties, based upon an evolutionary species concept. These are the Gabilan B. gavilanensis (ranges s. Santa Cruz Co. down both sides of the Salinas Valley to the Cholame Hills), Santa Lucia B. luciae (ranges Monterey Peninsula down west slope of Santa Lucia Mts. to Mill Creek), San Simeon B. incognitus (around San Simeon in n.w. San Luis Obispo Co. and extreme s.w. Monterey Co.), and Lesser B. minor (very local inland in n. San Luis Obispo Co.). The Gabilan barely overlaps with California Slender Salamander B. attenuatus in c. Santa Cruz Co. [B. attenuatus ranges from there north to Del Norte Co.] while the San Simeon and Lesser Slender Salamanders occur sympatrically with the Black-bellied Slender Salamander B. nigriventris. Much of the work is based on DNA evidence, but that evidence shows that the ancestors of today's Gabilan and Santa Lucia Slender Salamanders began diverging 4 to 5 million years ago. Slender salamanders are an ancient lineage. They are entirely sedentary and in their entire lifespan an individual may move no more than a few square yards (home range in one study was just 12-16 m2, and animals were typically recaptured no more than 6 feet from their previous capture; they may use the same logs or cover objects from year to year (Hendrickson 1954). This means that slender salamanders -- perhaps more than any other type of vertebrate -- are simply "riding" the underlying tectonic plates. Central California has a very complex and active history of volcanic and fault activity. The San Andreas Fault system is world famous. The rocks underlying the land on which my house sits in Pacific Grove on the Monterey Peninsula were once much farther south -- as far south as the latitude of Central America about 72 million years ago. The underlying tectonic plates have been moving north along the fault lines ever since. Jockusch, Yanev & Wake (2001) construct a scenario in which the Gabilan strata (and the salamander riding along) moved north more quickly than the Santa Lucia strata by several million years and didn't reconnect until rather recently in geologic time. The current range of the two salamander "riding" their moving strata well parallels the geology. [Incidentally, the Farallon Islands are part of the same Gabilan strata system, which is likely why the Arboreal Salamander on the Farallones so closely resembles those in the Gabilans.] The species evolved during the interim. Because they are so sedentary, the Gabilan and Santa Lucia slender salamanders are now found in the eastern part of the town of Monterey within a few meters of each other without overlapping (Dr. D. B. Wake, pers. comm.). The photo (left or above left) is of a Santa Lucia Slender Salamander in Pacific Grove, near an egg mass (possibly its own eggs). Both the salamander and the eggs were under a log just as shown -- I did not touch any of them. Slender salamanders are active on the ground surface during periods of wet weather, foraging mostly at night and hiding under cover objects (logs, boards, loose rocks) during the day. They retreat underground whenever the soil dries or the air temperature drops below freezing. Individuals remain underground the entire summer and are thus near the surface only in the winter or when it rains (Hendrickson 1954, Petranka 1998). After mating, females deposit 5-20 rather large eggs (compared to their body size; see photo), surrounded by capsules and connected by chords of jelly in rosary like chains. Although females may be nearby, they don't active brood the eggs. The youngsters hatch in about two months. Although much of the work on slender salamanders recently has been of biochemical analysis, the various species do differ in body size and length, leg size and length, head shape, and body color (as well as details of teeth or skeleton that we can't see on live animals). A fair number of species have variation in the color and lightness of their back stripe, but in my part of the world in Monterey County, the Gabilan tends to have a nice coppery stripe while the Santa Lucia tends to remain quite dark and sooty (but exceptions occur). 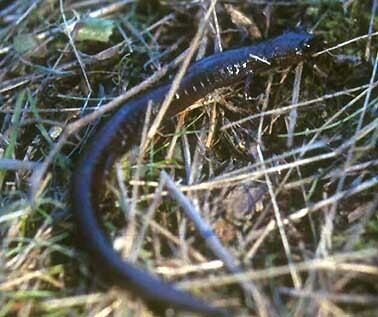 The Gabilan is considered to have short limbs while those of Santa Lucia are more robust; neither is as slim-headed as California Slender Salamander B. attenuatus to the north, or the Black-bellied Slender Salamander B. nigriventris to the south. Pacific Slender Salamander B. pacificus (on the Channel Islands) and Garden Slender Salamander B. major are a bit more robust and broad-headed than the northern species. There are differences in the average number of costal grooves between the limbs, but I find this very hard to do except on photos. The gallery that follows shows a variety of species from north to south along the California coastal ranges. An isolated population of Garden Slender Salamander is found in Hidden Palm Canyon, Riverside Co. It was originally described as a new species: the Desert Slender Salamander B. aridus (Brame 1970). This habitat was purchased by Calif. Fish & Game and is managed for the salamander's protection. The taxa was recently considered a subspecies of B. major [e.g., Jockusch, Yanev & Wake (2001)]. Another new species -- the Santa Gabriel Mountains Slender Salamander B. gabrieli -- was recently described from Los Angeles Co. (Wake 1996). Additional species at various elevations in the western foothills the southern Sierra Nevada are all local (and some are considered endangered): Relictual B. relictus, Kern Canyon B. simatus, Tehachapi B. stebbinsi, Kings River B. regius, Hell Hollow B. diabolicus, Gregarious B. gregarius, and Sequoia B. kawia (taxonomy following Crother et al. 2001; see also Jockusch, Wake & Yanev 1998). And the Inyo Mountain Slender Salamander B. campi is isolated east of the Sierra in mountains near Death Valley. As yet I have no experience with any of these, but hope to see and photograph some in the future. 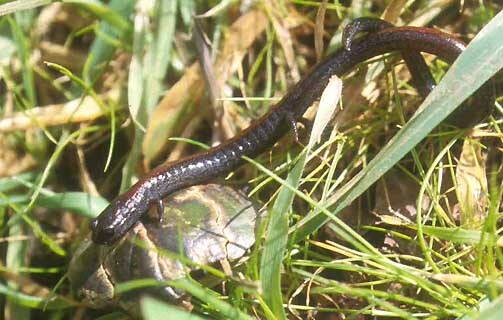 Although some slender salamanders are sympatric (e.g., B. minor and B. incognitus with B. nigriventris), most are not. Thus drawing lines between species is difficult and can be controversial. Jockusch, Yanev & Wake (2001) and Jockusch, Wake & Yanev (1998) used an "evolutionary species" concept. For those who may have read my discussions of bird taxonomy elsewhere on this web site, you may know I am a supporter of the "biological species" concept, at least as compared to the "phylogenetic species" concept that is currently playing havoc in the ornithological world. I know rather little about herpetology, but Petranka's (1998) new book on North America salamanders discusses similar controversies within that realm. Petranka supports the biological species concept and, as far as I can tell, so does the most recent SSAR checklist (Crother et al. 2001). With primarily allopatric populations of Batrachoseps, it is not possible to use the primary test of the biological species concept (reproductive isolation from near relatives), so I can sympathize with researchers who have developed alternative theories. Jockusch, Yanev & Wake (2001) recognize that some of their species-level decisions may be controversial. They recognize, for example, that B. minor and B. incognitus may be isolated subspecies of B. luciae. Yet their work does appear conclusive that Santa Lucia Slender Salamander (whether or not it includes Lesser and San Simeon) is a separate species from Gabilan Slender Salamander (despite the lack of any known overlap to date) and, because there are areas of sympatry, is clearly distinct from California B. attenuatus and Black-bellied B. nigriventris. If one is interested in species concepts, these salamanders are full of excitement! It is encouraging to me to see Jockusch, Yanev & Wake (2001) accept subspecies (indeed, they "down-graded" B. aridus to a race of B. major) which clearly separates their methodology from the morass that is the phylogenetic species concept. 1 Jockusch, Yanev & Wake (2001) actually use the English names Gabilan Mountains Slender Salamander and Santa Lucia Mountains Slender Salamander for B. gavilanensis and B. luciae, respectively. From the perspective of a birder who has been passionately interested in standardizing English bird names for names, these monikers seem much too unwieldy to me. I have dropped the "Mountains" part of each name. Both species occur at sea level far from the mountains; B. gavilanensis also occurs widely on the east slope of the Santa Lucia Mountains. While it is easy to think of them as generally in the Gabilan and Santa Lucia districts -- and riding on their underlying tectonic plates -- using the word "Mountains" in their names could be confusing. Although the species had not then been formally named, Petranka (1998) also used the names Gabilan and Santa Lucia slender salamanders without the needless insertion of "Mountains." I hope that the SSAR checklist revision will use the simpler names. A USGS identification guide, in progress. The pages that are completed have great close-up photos and colorful range maps. For Batrachoseps, there is a page on the Relictual/Garden/Desert/Pacific slender salamander group. AmphibiaWeb: a U.C. Berkeley site with photos, lots of text (esp. life history), and references. Or you can go directly to photo galleries at the preceding link. John Sullivan's 'Wild Herps': a personal checklist with great photos and stories of finding many of our western herps, centered in Pacific Grove, California. Brame, A. H., Jr. 1970. A new species of Batrachoseps (slender salamander) from the desert of southern California. Los Angeles Co. Nat. Hist. Mus. Contrib. Sci. 200: 1-11. Brame, A. H., Jr., and K. F. Murray. 1968. Three new slender salamanders (Batrachoseps) with a discussion of relationships and speciation within the genus. Bull Los Angeles Co. Nat. Hist. Mus. 4: 1-35. Bury, R. B. 1971. Endangered and rare reptiles and amphibians of California. Unpublished project, Mus. Vert. Zool., U.C. Berkeley. Crother, B. I., ed. 2001. Scientific and Standard English Names of Amphibians and Reptiles of North America north of Mexico, with Comments regarding Confidence in our Understanding. Society for the Study of Amphibians and Reptiles, Herpetological Circular 29. Jockusch, E. L., D. G. Wake, and K. P. Yanev. 1998. New species of Batrachoseps (Caudata: Plethodontidae) from the Sierra Nevada, California. Los Angeles Co. Nat. Hist. Mus. Contrib. Sci. 472: 1-17. Jockusch, E. L., K. P. Yanev, and D. B. Wake. 2001. Molecular phylogenetic analysis of slender salamanders, genus Batrachoseps (Amphibia: Plethodontidae), from central coastal California with descriptions of four new species. Herpetological Monographs 15: 54-99. Marlow, R. W., J. M. Brode, and D. B. Wake. 1979. A new salamander, genus Batrachoseps, from the Inyo Mountains of California, with a discussion of relationships in the genus. Los Angeles Co. Nat. Hist. Mus. Contrib. Sci. 308: 1-17. Petranka, J. W. 1998. Salamanders of the United States and Canada. Smithsonian Instit. Press, Washington, D.C.
Stebbins, R. C. 1966. A Field Guide to Western Reptiles and Amphibians. Houghton Mifflin, Boston. Stebbins, R. C. 1985. A Field Guide to Western Reptiles and Amphibians. 2d ed. Houghton Mifflin, Boston. Wake, D. B. 1996. A new species of Batrachoseps (Caudata: Plethodontidae) from the San Gabriel Mountains, southern California. Los Angeles Co. Nat. Hist. Mus. Contrib. Sci. 463: 1-12. PHOTOS: All photos were taken in California. The California Slender Salamander was 31 Mar 1978 in Garden Canyon, near Bolinas, Marin Co. 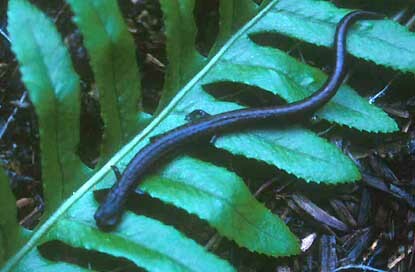 The Gabilan Slender Salamander was 17 Feb 2002 near Aptos, Santa Cruz Co. 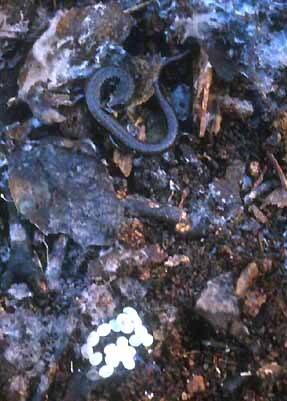 The Santa Lucia Slender Salamanders were on 3 & 10 Feb 2002, in Garrapata State Park and Rip Van Winkle park, Pacific Grove (with eggs), respectively. The Garden Slender Salamander was 13 Feb 1999 in Cleveland National Forest, Orange Co. All photos © 2002 Don Roberson, all rights reserved.